Sharon Matisoff makes this statement with such unabashed enthusiasm that one could not possibly doubt the earnestness of the claim. 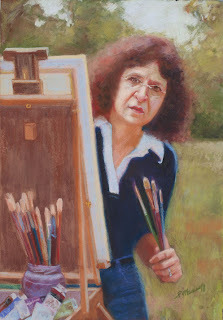 Having explored a range of subjects throughout her history as an artist, from participants in renaissance faires to young ballet students, and the inevitable recruiting of family members, sometimes when they don’t particularly feel like being a subject, now the driven painter turns her observant eye to other artists. 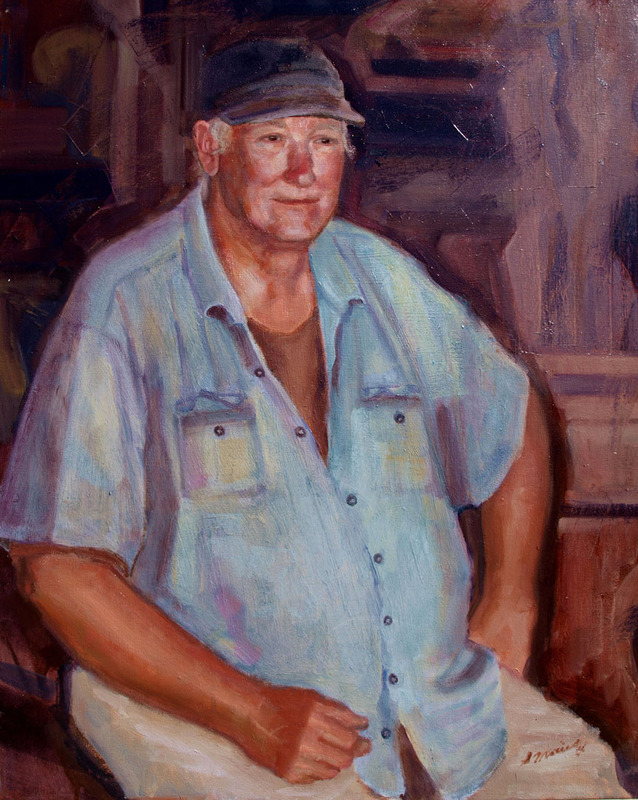 In “Rites of Passage: A Celebration of Louisville Artists,” a new exhibit about to open at Kaviar Forge and Gallery, portraiture is the order of the day and the artist working in the studio is the theme. Ms. Matisoff is an experienced portrait artist, and this particular adventure began after gallery owner Craig Kaviar saw his own portrait in pastels and suggested the artist use it as the jumping off point for a series. She set about pursuing subjects, often with one artist suggesting another until she had accumulated a host of local painters, sculptors, ceramicists and fibre artists. 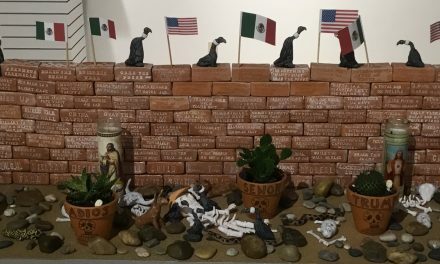 While the task at first seemed daunting, Matisoff was given a warm reception from all the artists she approached, a fact that underscores the communal thread that unites all artists in society and provides something of a subtext for her work. 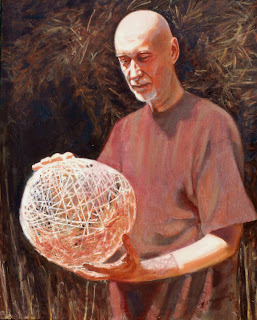 That connectivity among creative individuals becomes an important aspect of the straightforward compositions of the paintings. If there is a certain stolid uniformity in the way the figures are placed, even when working, it seems by design rather than any lack of ingenuity on the part of the artist. It is not characteristic of her previous work, which charts a restless and perhaps even relentless journey of exploration. When discussing her past work, the artist has stories for every painting, one concerning the subject, and another that charts her growth and self-examination. This duality of purpose is here manifested explicitly in the decision to create for each subject two separate images, one in oil and another in pastel: one straightforward set-up in which the subject gazes directly at the viewer, and one showing the craftsman at work. 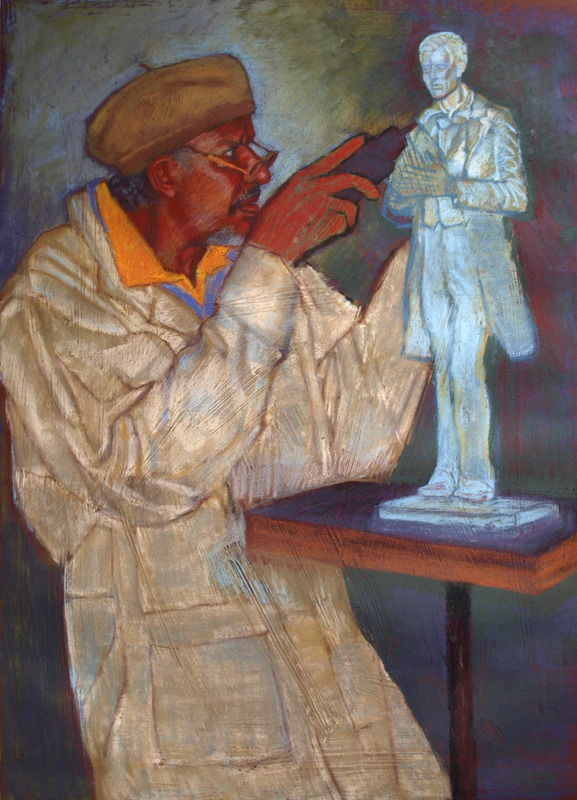 The latter are notable for the specificity of gesture, the painter’s eye capturing the most evocative angle of the wrist when Ed Hamilton grinds the surface of a small sculpture, or the concentration displayed by the tongue embedded in Lucas Nelson Marvell’s cheek while he fashions wood for a violin. 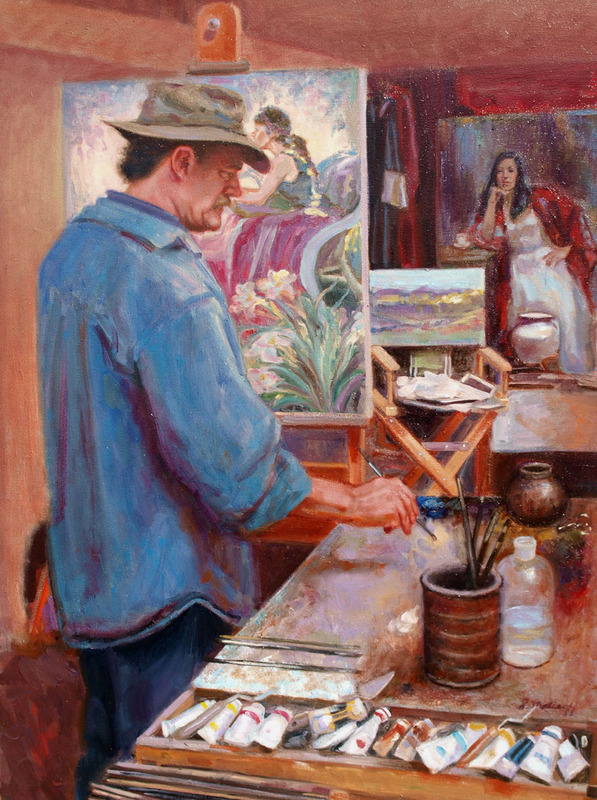 John Michael Carter at His Easel, Oil. Some of the compositions are more complex, such as when we see painter John Michael Carter at work on a canvas, the work table including tubes of oil paint in the foreground that usher us into the studio space and the depiction of other Carter canvases in the background. The idea of portrait encompassing the studio environment, including recreations of the subject’s work, reoccurs in the series but is most prominent in this example. Many of the other paintings are more rooted to the physical human presence, and there are instances wherein the depiction of the artist manages to express something of the nature of their work. Sculptor Al Nelson seems to occupy space with a statuesque quality befitting a stone carver, his rough-hewn visage resting atop a monolithic torso: the man as monument. Each image makes for a satisfactory portrait on its own merits, but the series as a whole touches upon more expansive themes of community and connectedness among individuals with a shared passion for making art. In Dennis Shaffner’s oil portrait, the artist appears to simply be holding one of his woven-vine constructions between his two hands; yet the natural light striking the face and the orb shaped piece not-quite-in-his-grasp are captured by Ms. Matisoff so that the object of the artist’s attention takes on an otherworldly, almost preternatural presence: the spark of creativity made manifest in how one artist sees another. It connotes a spiritual quality that, upon reflection, is present, if more subtly, in the other pieces. This same glow can be seen in each artist’s eyes: the act of creation as one action combining the tangible and ephemeral in equal measure. Still, the compositional formality is part and parcel of a classical approach to portraiture that emphasizes psychological insight over dynamic visual structures. 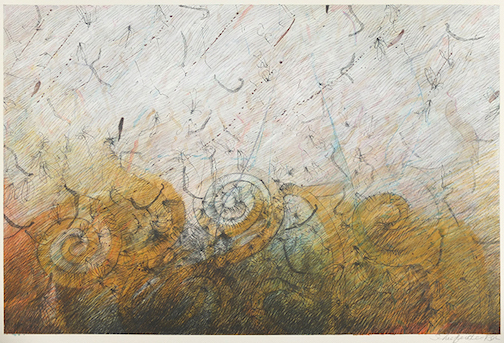 In Matisoff’s previous series, the subjects afforded her the opportunity to construct group compositions that overtly conjured up the relationship between the members of a particular community: participants in a renaissance faire socially bonded by an interest in a specific historical period; or the students who embrace the discipline of dance at an early age, either engaged in the practice of movement or at rest along the sidelines. Subtle relationships of human experience expressed through the relationships of color, light and composition. In this new series, which the artist describes as “the most important group, because it (art) is the most important aspect of myself,” there are no collectives, no artists talking among themselves or working side by side, so that the relationships must leap from canvas to canvas, linking each individual into the community through repetitive composition and positioning; and the depiction of that sacred act of creation that is shown in the “action” portraits: paint-filled brush poised above a canvas, hands sunk into soft, slippery clay on the wheel, fingers manipulating tools that dig and grind into more recalcitrant materials. 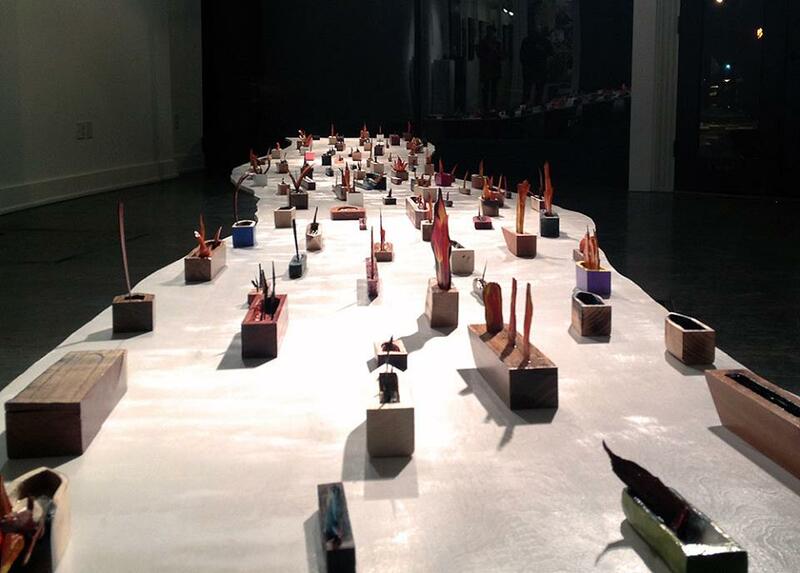 Ultimately, they work as pieces of the whole, the entire exhibit functioning as one singular and glorious expression of community. Previous60 Minute Star Wars Is Back at The Alley Theater and Still Fun! Thank you for this excellent review of Sharon’s new show! I am looking forward to the show on opening night. She has done a fabulous job!